When copywriter Victor Dean falls to his death on the stairs of Pym's Advertising Agency, no one seems to mind. That is, until Lord Peter joins the firm incognito as Dean's replacement and starts asking questions which lead him into a network of blackmailers, drug pushers and one of the most deadly plots of crime fiction. However, before the crimes can be solved and the truth revealed, five more people must die... 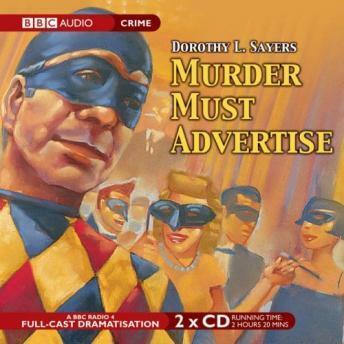 The elegant, intelligent amateur sleuth Lord Peter Wimsey is one of detective literature's most popular creations. Ian Carmichael is the personification of Dorothy L. Sayers' charming investigator in this BBC Radio 4 full-cast dramatisation.